In 2002, Dr. Michael Atkins published a revised edition of his low-carb dietary vision: Dr. Atkins’ New Diet Revolution. The diet, which had been the thrust of much of Dr. Atkins’ research programme since he published his first paper on it in 1958, was nothing new. Low carb diets have come and gone as dietary fads for the better half of two centuries, and with our culture so heavily invested in our appearance, new diets pop up every year. The two most popular diets that come to mind at the moment include the Paleo diet and the Wheat Free diet, which in essence are the same style of diet. They both advocate for the elimination of cereal grains from the diet, with the Paleo diet calling for the elimination of all grains from the diet, among other items. The Atkins Diet: no carbs! Like most fad diets, these two diets were created by individuals who possessed a high level of post-secondary education. They based their argument for their diet’s effectiveness on scientific evidence, and given their credentials and educational background, their case holds a lot of merit on the surface. Unfortunately, what their followers fail to recognize is the process by which good science is performed: replication, peer review, and sound logic. The issue with these diets, like all fad diets before them, is the fact that they are rooted in poor science packaged as credible fact simply due to the title of their inventor. It’s the same argument I pose when someone mentions Dr. Oz and a product he advertises on his show. He uses his M.D. to give his bad science and arguments credibility, when in fact he often bases his assertions and “facts” on one or two poorly designed studies. 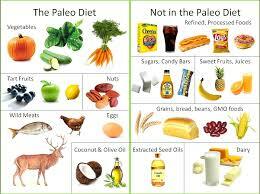 The Paleo diet was first described by gastroeterologist Walter L. Voegtlin in a paper he published in 1975. His argument is heavily based on anthropological presumptions, and completely ignores the possibility of genetic mutation and adaptation of the human species. The diet argues that as humans, we evolved in hunter-gatherer societies, and should only consume foods that existed in the pre-agricultural era. At first glance, this does seem like a plausible argument: a high order species such as humans do not evolve and adapt as quickly as lower order species like bacteria, which can change rapidly in response to their environments due to their short generation time. The problem with this way of thinking is that it ignores some key changes in the human genome. In the Paleolithic Era, humans could not consume lactose (the sugar in dairy products) because we lacked the enzyme (lactase) to do so. We have since evolved, and now being lactose-tolerant is the norm. The mutation for blue eyes was estimated to have evolved around 6,000 – 10,000 years ago, and while this isn’t a dominant trait in humans, it is still a prevalent one. Another incorrect assumption of the Paleo diet is the consumption of plants and animals themselves. Virtually all plant species today have been genetically selected and altered over the past 10,000 years. Broccoli, Brussels Sprouts, Kale, and Cauliflower are all the same species of plant (Brassica oleracea), and the only reason these different vegetables exist today is agricultural selection. All of the domesticated animals whose meat we consume are also drastically different as a result of domestication and breeding, so if we are basing a diet around Paleolithic nostalgia, shouldn’t we reject all domesticated forms of fruits, vegetables, and meat? If we should consume foods akin to our ancestors, then shouldn’t the foods be the same ones that were consumed by them 10,000 years ago? The fact is, the Paleo diet has been around for over thirty years, gained popularity briefly in the 1980’s after a paper in the New England Journal of Medicine supported its use, but it went away shortly after, only to resurface in the last few years. Why has this happened? 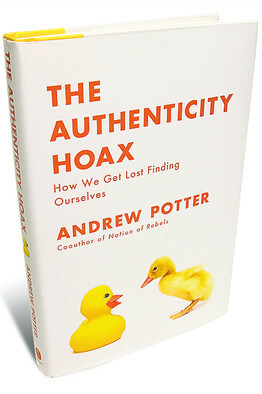 In 2010, Andrew Potter published a book called “The Authenticity Hoax”. In the book, he describes the Western World’s recent obsession with being authentic as another quest to be “cool”. The fact that organic food was widely popular for a few years until big box stores such as Wal-Mart began incorporating organic items on their shelves is no coincidence: this pattern is seen everywhere. Now if you purchase something organic, it’s a nice bonus, but the status posturing that went along with it is largely non-existent. Organic food waned in popularity, so the new cool thing to do was to eat local. Then all of the books, diets, and restaurants that followed the “100 mile” diet started appearing. Urban farming gained a brief foothold in the backyards of many urban hipsters, and farmer’s markets experienced a brief renaissance period. 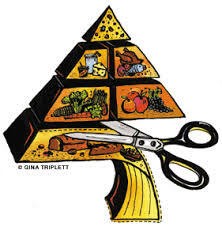 The local diet has yet to be captured by the masses, so while it is still the cool thing to do, it’s only a matter of time before something else comes along to usurp it. Enter the Paleo diet’s resurgence. It is no accident that the diet gained popularity: the Paleo diet is an authenticity driven fad diet. Rather than keep things spatially authentic, food trendsetters have set the frame of their new trend in a chronological sense. Another reason that the Paleo diet has gained such a large following is that it was coupled to another armchair scientist related idea: CrossFit. CrossFit (like the Paleo Diet) was in fact developed a few decades ago by Californian Greg Glassman, a former gymnast, in the hopes of improving his current weightlifting routine. He combined gymnastics exercises with Olympic weightlifting exercises and developed the CrossFit program. He based it on the philosophy of constant movement, like our ancestors evolved with during the Paleolithic Era. He pointed out that most workout routines involve few muscle groups with repeated periods of rest in between, which is not reflective of our evolutionary biology. I won’t get into much of a criticism of CrossFit, since the world is abundant with it, including numerous physicians criticizing the health problems caused by over strenuous bouts of exercise, namely, rhabdomyolysis. 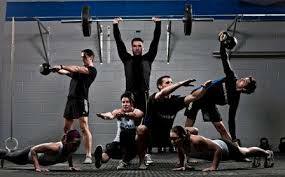 What I will comment on is the rise of CrossFit and why it grew so quickly. Although Glassman officially branded and introduced his program as CrossFit in 2000, the program itself has been around for over thirty years, and with the fitness craze in the 1980’s, the cultural attitude existed for a fitness program to launch successfully, so why did it take over 30 years for CrossFit’s popularity to peak? The same reason that the Paleo Diet experienced such resurgence: the Western World’s craving for authenticity. The “science” that CrossFit’s philosophy is based on the same vein of thought that the Paleo Diet is: Paleolithic humans were hunter-gatherers, and as a result were constantly moving due to their nomadic, unpredictable lifestyle. You never knew when your next meal would come along, or when some animal would come along that would want to make you its next meal. Tribal warfare was quite prevalent, so physical strength was paramount for survival. Again, the theory makes sense, but when you think about how relatively sedentary humans have become in the past 8,000 years since the introduction of agriculture, it’s not surprising that CrossFit is not as effective as it’s purported to be. It’s also why you have so many people injuring themselves (poor lifting form aside): the average human body simply isn’t meant to be thrown into such an intense routine without a history of athletic prowess. This is why most people who do CrossFit will see diminishing returns: humans who are genetically better athletes will benefit, but most humans are not genetically gifted as such, and as a result will probably do more harm than good to their bodies as a result. While these CrossFitters might be ripped, most people simply don’t have the genetic potential to be this way. I am not against people getting in shape and pushing themselves to be better. I am not against people altering their diet to something that is healthier. My issue is that there are far too many people buying into these programs time and time again, constantly jumping ship, changing who they are, and completely buying into the lifestyle that these programs represent without stopping and just thinking for a second. When the next big fitness trend comes around, or when the newest diet arrives, just wait for your Paleo or CrossFit friends to drop everything and jump ship. What people should be conscious of is the fact that this lifestyle simply is not sustainable. There is a constant cycle of lifestyle change, possible friend alienation, and the purchase of new products, only to discard all of that for the next trend in an effort to be cooler than the next person. Fitness and diet trends are often the most prominent, due to the complexity of the human body and our (relatively) poor understanding of it; these two factors are drivers behind the constant search for new ways to eat and exercise. In 2009, Christopher McDougall published Born to Run, which popularized the practice of barefoot running. 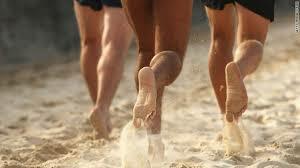 This new style of running was based on the way that humans historically ran: barefoot, or with minimalist footwear. Barefoot running enthusiasts state that this form of running reduces injuries caused by heel-tapping, which is commonly experienced while wearing running shoes. Humans ran for centuries without modern running footwear, and injuries were not evident based on anthropological research, so why should modern humans be any different? Barefoot Runners: Ticking time bombs for shin splits. The problem with this line of reasoning is rooted in the Naturalist Fallacy. What barefoot runners have ignored in their assumptions is that modern humans have grown up wearing shoes all of their life, and that altering the skeletomuscular structure of a human is quite a complex process. Ancient humans who ran barefoot grew up running in their bare feet. They walked, ran, and hunted barefoot, so their bodies were adapted to the process. Ancient humans also didn’t take the majority of their steps on pavement. Modern humans seem to think that a few weeks of barefoot running will change a few decades’ worth of adaptation to running shoes and paved sidewalks, and the injuries that result from barefoot running are the result of this myopic and misled view on how we should be running. 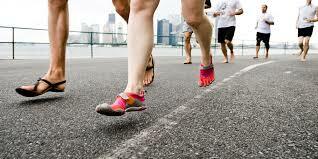 How Barefoot Running evolved, and should be. We think that simply because something is natural or historically relevant, it will also neatly fit into our lives. What we neglect to think about is how drastic the changes in our world have been in the past century. Every time I see someone wearing barefoot running shoes out for a walk in the city or out for a run on the sidewalk, I shake my head. If only they could see the irony of how their “natural” form of running or walking is taking place in the most unnatural environment on the planet. I’ve yet to hear of any measurable benefits of barefoot running, and I believe the merits of this movement fall in line with the Paleo Diet and CrossFit: authenticity driven movements that are all victims of the Naturalist Fallacy. We need to recognize that as humans in the 21st century, we have changed our world, and we as a species have changed as well. As nice as little doses of nostalgia are, to alter your entire lifestyle around some obscure, almost pseudoscientific idea is misguided. I do think that we need some more naturalist principles in our lives, but they need to be properly adapted to mesh well with modernity. In the meantime, stop listening to armchair scientists and changing your entire life, but try to take away the positive benefits that the lifestyle encourages. Previous Post Stop Being Boring and Basic: Be Passionate! Pingback: Why Quacks Exist | Thoughts.